Recently a bulge developed on my drivers side tire, and the rest were wearing out. After checking out their website, TJ Auto & Tire seemed like a good place to go. When I got off work on Sunday at 8 pm, I went to check it out, since Google Maps indicates that it closes at 9 pm everyday. Unfortunately, those hours arent correct. I phoned up Tyler (the owner), and he agreed to work on my car the following Monday, and would give me a good deal. From the phone call, you can tell Tyler is extremely friendly and loves his job and his customers. I was not at all disappointed about his business hours being messed up. When I met Tyler, he was extremely knowledgable about cars, and answered many of the questions I had. I hung around for a bit, and he introduced me to his dog Chico, a Keeshond, who is super playful and friendly as well. The whole process of tire installation went quick, roughly 40 to 50 minutes. The waiting area was nice and warm and you had Chico to play with as well. After the tires were on, Tyler gave my car a quick rinse down, which I greatly appreciated as it made it shiny clean. Long story short, Tyler will provide you a professional service that you cant find anywhere else, not even places like Canadian Tire will provide this kind of professionalism and personal service to you. I will definitely be coming back. I needed to get my tires replaced and brakes done at the same time so I looked around and found TJ Auto & Tire. They have the best reviews in Richmond so I didnt hesitate to give them a call. Setting up the appointment was easy. Tyler gave me a quote over the phone and time needed for the service. Dropped off my car in the morning and picked it up in the afternoon with new brakes and tires. Price was exactly as quoted no extra no surprises. This will be my go to shop from now on if I needed anything done. Reason for the visit: Ive been taken my 2014 Honda Odyssey to the dealer ship twice for rotor resurfacing. There seems to be issue from model 2011+ and various other Honda models that uses the same pads/rotors. A simple google search you will find various forums about the vibration issue due to uneven wear. Instead of going back to Honda for a set of new brakes that will potentially give me the same problem I decided to give Raybestos a try. It was also time for me to get a new set of tires. With the past winter in mind Ive decided on a set of Continental TrueContact. They are one of the best all season tires in the snow. I was lucky enough to have chose Tyler to help with my mother in-laws car a few month back. 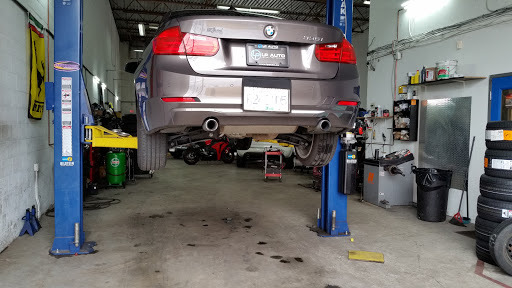 Her car had a severe issue where the brake fluid was leaking and the car wont stop. Tyler was extremely helpful and polite, he recommended a towing company where we towed the car to his place. Most of my experience in the past with auto repair/service was rather secretive, you hand over the key and wait for their call in a few hours. But Tyler was different, he diagnosed the car in front of us and pointed to us where exactly the damage was and explained clearly what might have caused the issue. The entire process was very smooth, he then gave us a very reasonable quote for the repair and in a few days, we picked up the car, good as new and never had a problem with it since. And since I have referred him to my other friends and have only heard back great things, I would highly recommend Tyler to anyone I know and I will use him again for any car related issues. Read some review on Google here and decided to give them a try coz theyre relatively close to my work location. Glad I did that. My car needs to replace two rear tires / balancing, and give them a call, spoke with Tyler and told him Ill have my co-work to give me a ride so I can drop off my car during lunch hr and contact me back once the tire installation was done. But my coworker was sick and on that day, and when I went to the shop, I told Tyler that if possible Ill need the tire install done within an hour in order to get back to my workplace (even though their shop seem to be very busy on that day). He such a great guy and said it will be done in an hour, which is exactly what he did. Two thumbs UP! PS . I was paying by cash but did not bring enough change for my bill (unintentional), unexpectedly, Tyler decided to give me a big discount on the final price so that I do not have to seek another place and ask for a change etc. Recently purchased a complete set of Triangle tires from Tyler and can never be happier! The tires work exceptionally well and are also extremely affordable; definitely one of the best purchases ive made this year. Tyler is extremely friendly and knowledgable with his work. He stepped out of his way to inspect my old wheels, tires, and even lug nuts and studs. When he noticed that there were damages on my lug nut studs, he repaired them without charge - we can all agree that not a lot of mechanics would do the same. The service you receive from TJs is without a doubt top class! I will definitely be a returning customer and would recommend TJs to anybody who is looking for good service, honest opinions, and a good selection of tires. And of course, who can forget the friendly dog Tyler has! Let me start by saying Tyler was extremely professional, friendly, knowledgeable, and most of all trustworthy (which is a trait that a lot of auto shops could use more of). He did a quality job of patching a tire for me in a timely manner, even though I didnt have an appointment. He additionally was very open and informative about everything throughout the entire process, even entertaining all my curiosities and questions. I can tell that Tyler is an honest guy just trying to do a great job for the benefit of his customers (and succeeding at it). If I ever need any work done in the future, I know where Ill be going. The world could use more people like Tyler - give him your business and karma will thank you.